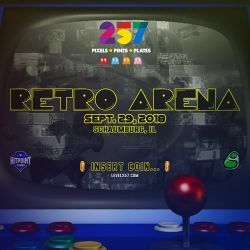 Retro Arena also known as Retro Arena at Level 257 was a regional tournament held in Schaumburg, Illinois on September 29th, 2018. It featured a arcade style and several Illionis players. This tournament is a reference to the Pac-Man game ᗧ•••ᗣ••. The venue Level 257, is inspired by Pac-Man and the name refers to the famous kill screen. This is also one of the few tournaments with both Cloud and Bayonetta banned in doubles. This page was last edited on October 6, 2018, at 01:53.